According to a report issued by the Federal Trade Commission today, between July 1, 2017 and June 30, 2018, the agency’s law enforcement actions yielded more than $2.3 billion in refunds to defrauded consumers, including $122 million mailed directly by the FTC to 1.28 million people. 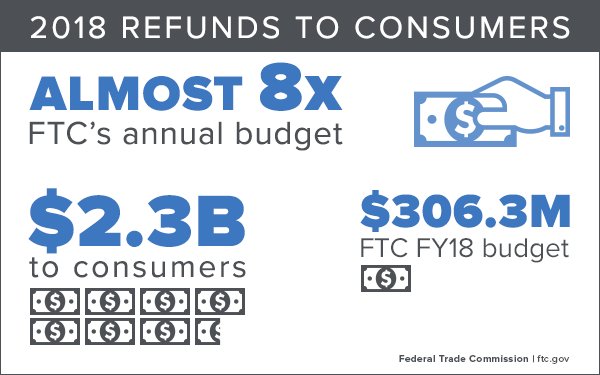 The total amount returned to consumers, which includes refunds distributed by defendants as a result of FTC actions against them, was almost eight times more than the Commission’s entire budget for fiscal year 2018. The 2018 Annual Report on Refunds to Consumers is the second annual report on money returned to defrauded consumers, and was issued by the FTC’s Office of Claims and Refunds. During the period covered by the report, the FTC mailed checks in more than 38 cases, and more than two-thirds of those checks were cashed by consumers. In some cases, the Commission was able to administer additional mailings using money left over from uncashed checks. Administrative costs associated with mailing refunds accounted for five percent of the money collected in these cases. The annual report outlines the process for identifying eligible refund recipients, determining how the money will be divided, mailing checks, updating names and addresses as needed, considering whether additional mailing are feasible, and sending any remaining money to the U.S. Treasury -- $12.5 million between July 1, 2017 and June 30, 2018. For each refund mailing that occurred during this period, the report provides the name of the case, the date of the most recent mailing, the number of consumers receiving checks, the total amount cashed, and the median check amount. This year’s report also includes a national map comparing the relative amount of money returned to consumers in each state, along with a list of the total dollars and number of checks mailed to each state. The $2.3 billion reported in this year’s report includes refunds from the landmark settlement with Volkswagen that required the company to offer a buyback program for owners of VW and Audi diesel cars fitted with illegal emissions defeat devices. The Commission vote approving publication of the report was 5-0.